Yes, it’s a timeshare. 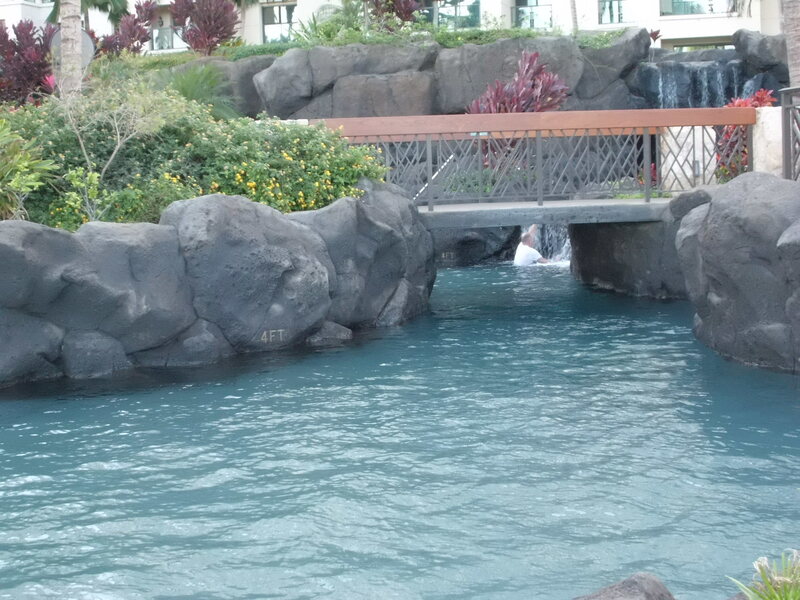 But it’s also a beautiful resort in Kapolei, Oahu, located on a man-made and very child-friendly private lagoon. 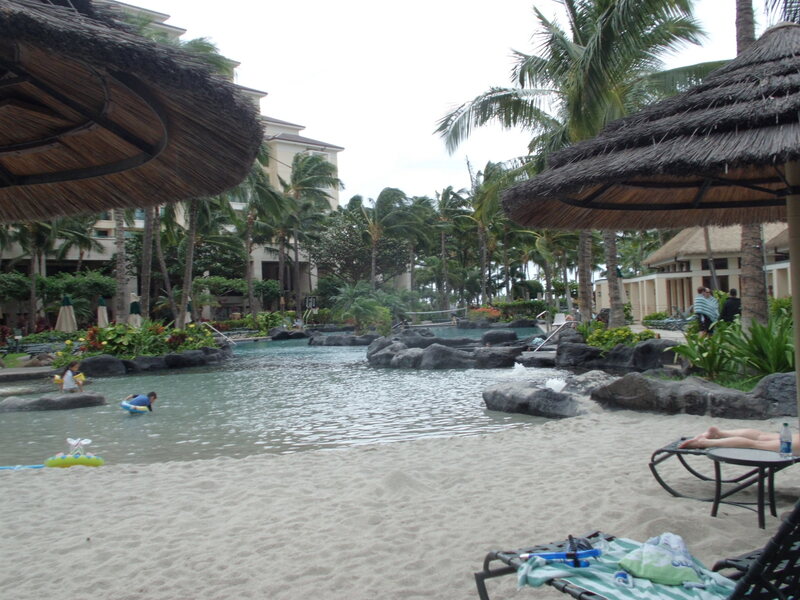 The Marriott Ko Olina Beach Club has 3 swimming pools and 7 whirlpool spas. We expected a few standard pools, maybe a water slide or some other cool feature to brag about, nothing we hadn’t seen before. But we were surprised and more than a little bit pleased to find 2 really fun pools the kids didn’t tire of, even after several days of swimming and exploring, with an extra Adults-only pool thrown in for good measure. I’m not sure what the main pool was called, but we referred to it as the “Beach Pool.” Not because it’s near the beach (just a short walk away) but because of the beach entry on one end, with lots of sand. Toddlers and younger can be plunked down with floaties and toys and be entertained for hours. Bring a good magazine. 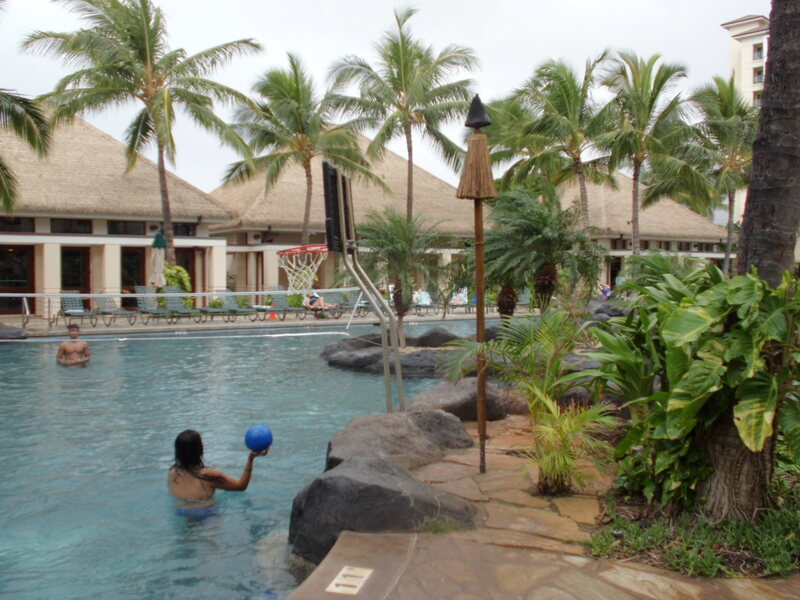 At the far other end of the same pool there are both volleyball and basketball nets, with balls available for check-out. There’s an island area in the center as well, which my daughter loved swimming to, jumping off of, hanging around. 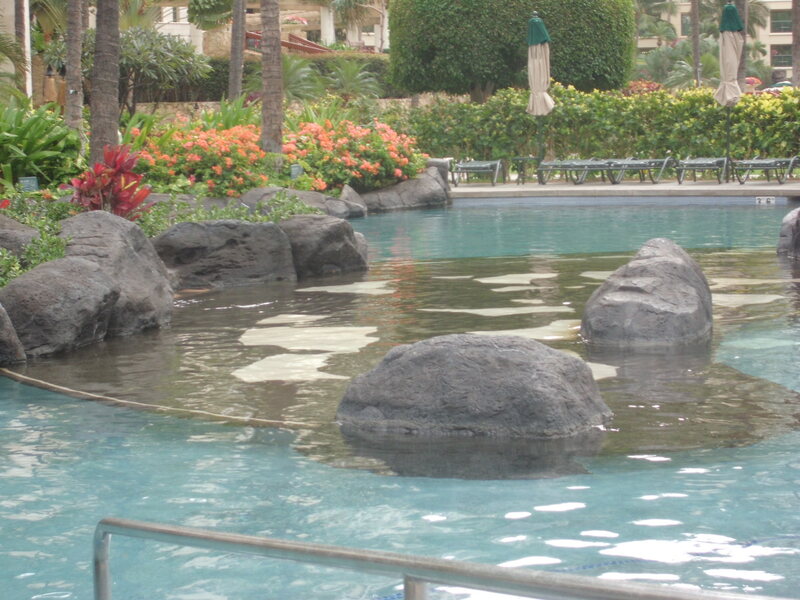 She also loved the little babbling fountains throughout the pool–totally unnecessary yet very much appreciated. 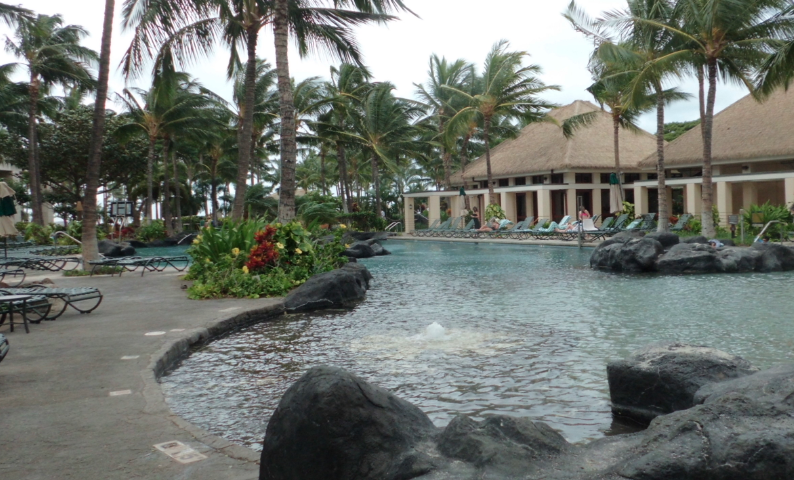 The pool is much bigger than a lot of hotel pools we’ve experience, and it’s only 1 of 3 pools on the property. Just on the other side of the hedge and closer to the shore is the “Reflection Pool.” This is the quiet area for adults only. It’s round, with a rocky island at the center. 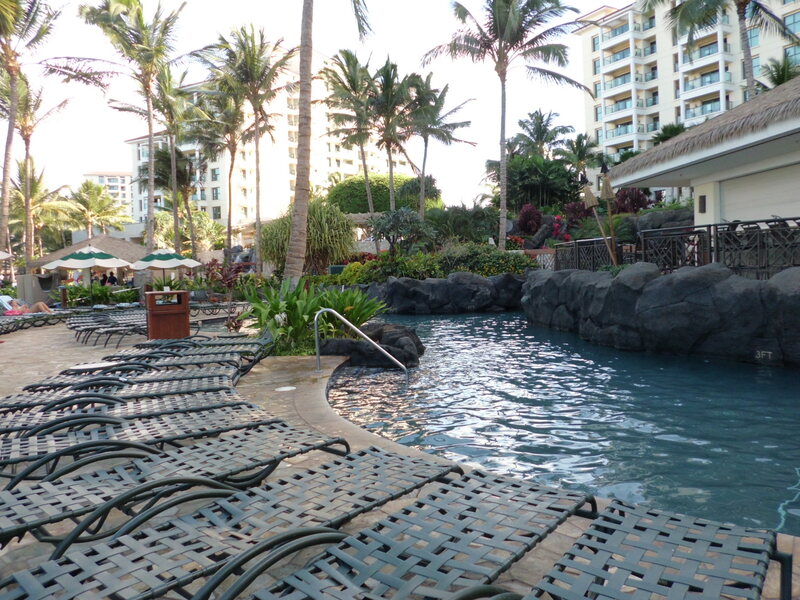 Often adults-only pools are small and tucked away from the action. This one is right there at the center of the property, next to the casual Longboards restaurant and right near the beach. It’s surrounded by chaise lounges, has its own jaquizzi, and was serene and quiet whenever we were near. It’s not completely silent since it is at the center of the resort, but people seemed to respect the vibe and used library voices in the vicinity. We called the third pool at the other end of the resort (close to the beach) the “Slide Pool” because it’s where the waterslide is. No duh. It’s surrounded by lava rocks and has waterfalls scattered about. 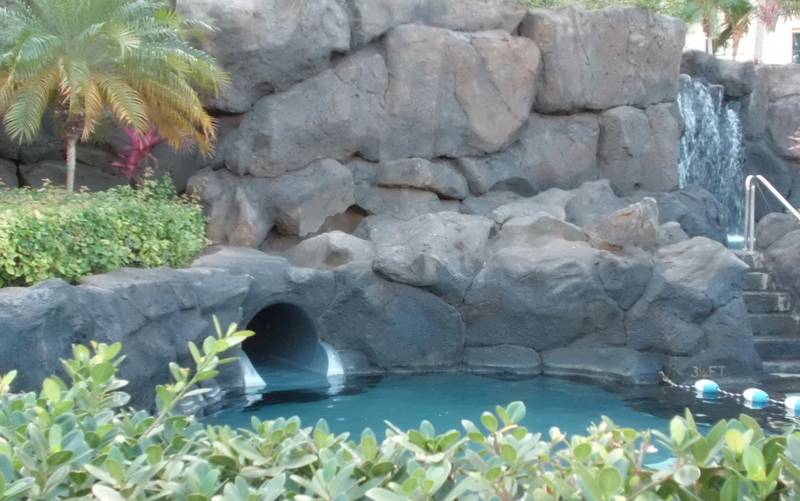 The pool winds around too, with a tunnel/bridge kind of thing separating two different areas. The kids had fun exploring the cave-like areas, going under the bridge. You can swim in this pool and feel like you’re actually covering ground, going places so to speak. It’s like someone ordered a lazy river, but they forgot to add the lazy. The resort has chaise lounges and towel service on the beach as well. It’s a waveless lagoon, perfect for teaching younger kids how to snorkle. The only drawback on the beach is that there’s no drink service, so you have to walk a few yards back onto the property to get your mai tais. A rough life in paradise. 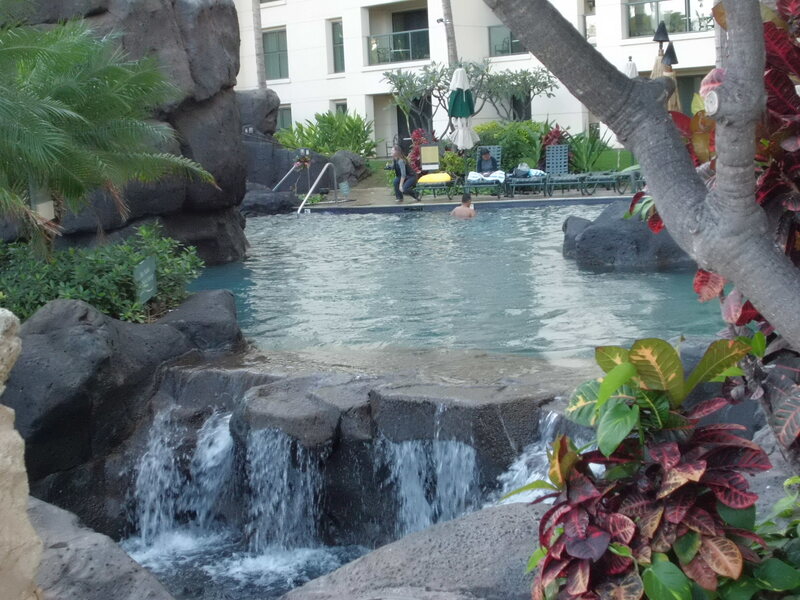 The entire property is only a lagoon away from Disney’s Aulani resort (read a review here). 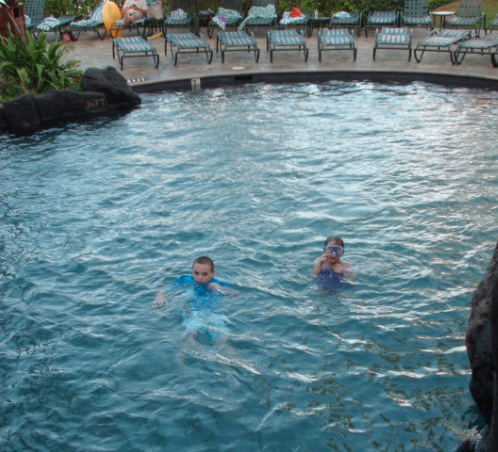 Budget-minded Disney fans might want to book a few pricier nights at the Aulani, enjoy all of the kid-friendly activities and then switch to the more pocket-book friendly Marriott. The kids will probably love both resorts. Ours did. It’s also at the other end of the series of lagoons from the J.W. Marriott. A little more upscale and better for those without kids, or with the swim-diaper set. Check out a review here. 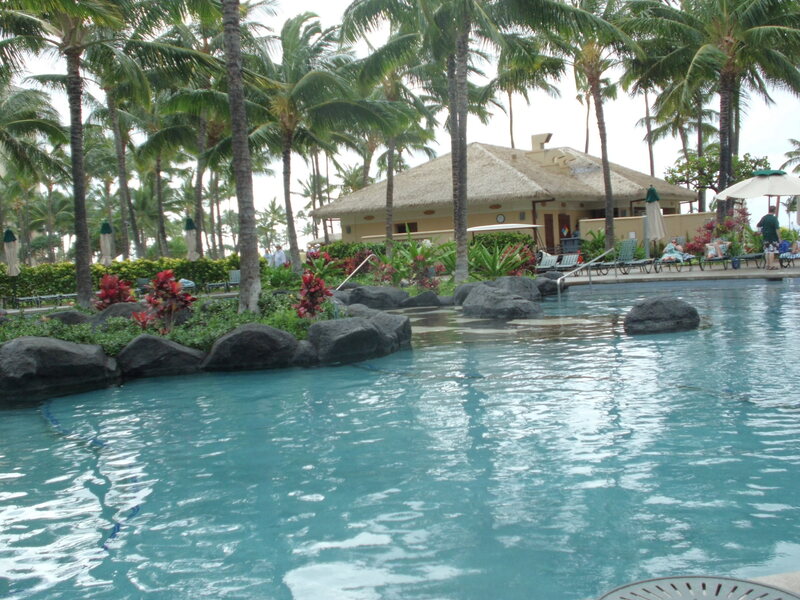 For more Hawaii pool reviews click here.